President Donald Trump is being criticized for his self-congratulatory tone in a Memorial Day tweet in which he said “those who died for our great country would be very happy and proud at how well our country is doing today” and then cited the growing economy and low unemployment. 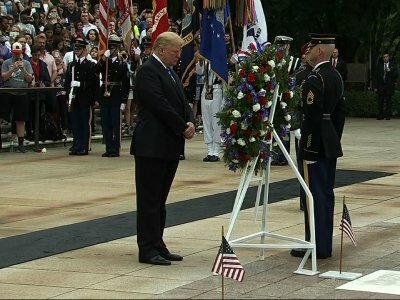 Trump sent the tweet Monday before heading to Arlington National Cemetery to pay tribute to those who died in service to the U.S.
President Donald Trump has marked his second Memorial Day as commander in chief by laying a wreath at the Tomb of the Unknown Soldier during a solemn ceremony at Arlington National Cemetery. He’s expected to make remarks before an audience in the nearby amphitheater. Trump stood by Gen. Joseph Dunford, the Joint Chiefs of Staff chairman, and Defense Secretary Jim Mattis before laying the wreath. President Donald Trump is marking his second Memorial Day as commander in chief with a planned visit to Arlington National Cemetery and a salute to those who have made the ultimate sacrifice for their country. He’s set to lay a wreath at the Tomb of the Unknown Soldier on Monday and then is expected to speak at a ceremony at the hallowed grounds across the Potomac River from the nation’s capital.